We worked with Micayla for our wedding, and we can't give her enough praise, she really is that good! She put so much work into our event and everything went so smoothly! She is so organized, responsive, professional, and accommodating, and she really takes a personal interest in each of her weddings, which is shown in how above and beyond she goes on the day of the event. All of the staff that worked on our wedding were also so great! I used to work as a server at weddings in Madison during college, and I can honestly say, they have the most organized process there, it really is amazing, and helps keep the bride/groom at ease on the wedding day. Everyone is so helpful and anticipated our needs throughout the day. Mark, the catering captain is awesome! He is so professional and organized and helped us out a ton on our wedding day! Lester, our head server was great too and really responsive! 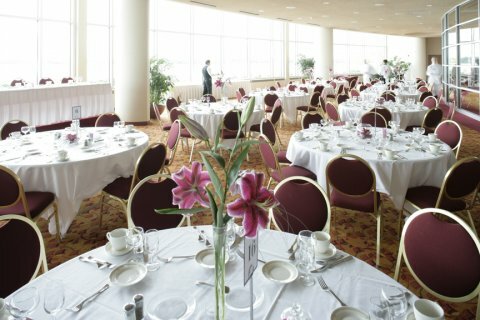 Overall, every Monona Terrace employee we encountered really took ownership, was respectful, responsible, polite, and professional and helped put on the perfect wedding day for us! If we could do it all over again, we would definitely do it at Monona Terrace again!